To celebrate the lauch of my new book, Super-Cute Felt Animals, I'm sharing a collection of free tutorials that you can mix and match with the projects from the book. 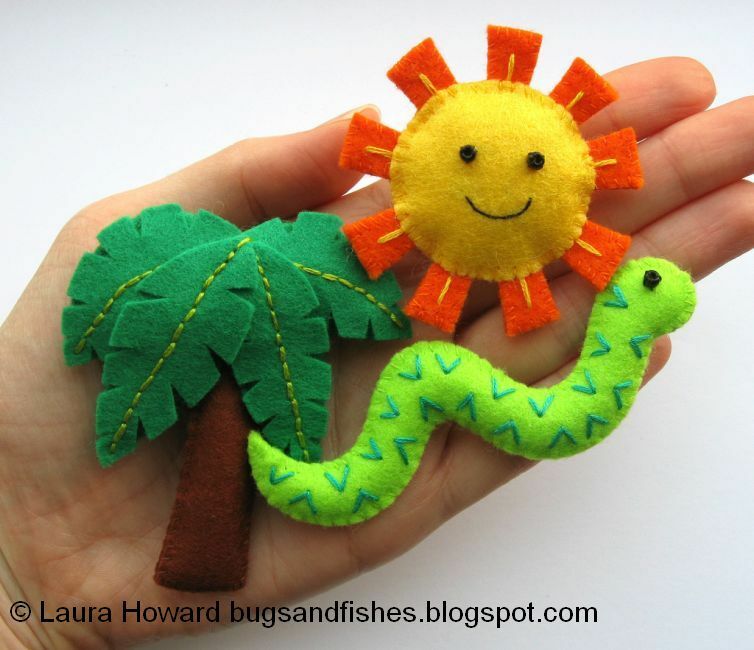 This week I'm posting three mini "extras" that are designed to coordinate with the animals in the "On Safari" chapter: a snake, a tropical tree & a bright sunshine. 1. 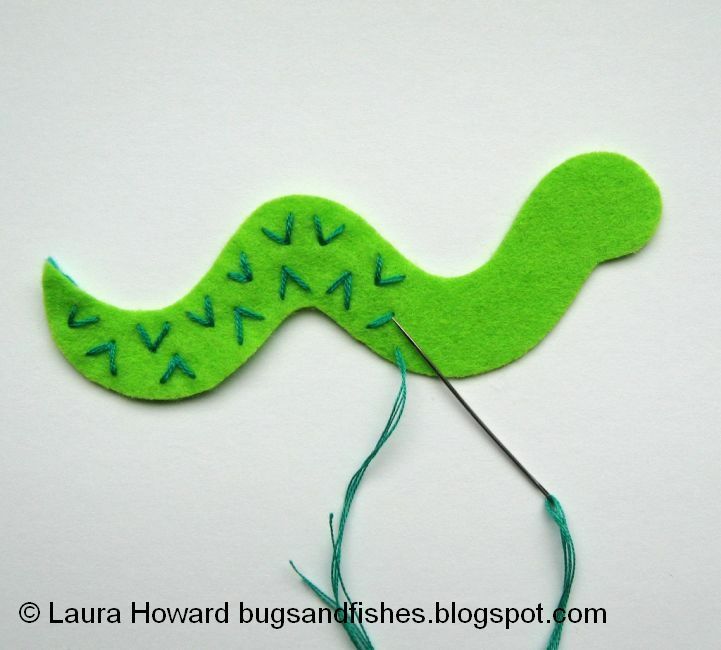 Use the template provided to cut out two snakes from lime green felt. 2. Cut a length of teal embroidery floss and separate half the strands (so for six stranded floss, use three strands). 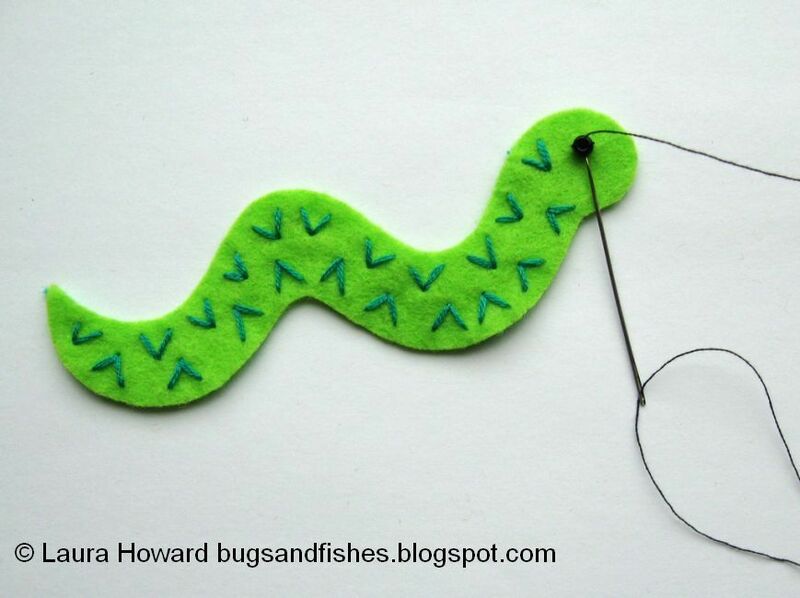 Use the floss to decorate one of the snake shapes with Vs made from two small stitches. Make sure you leave enough room to add the eye in the next step! 3. Sew on a black seed bead for the eye, sewing it flat like an O with three or four stitches of black sewing thread. 4. 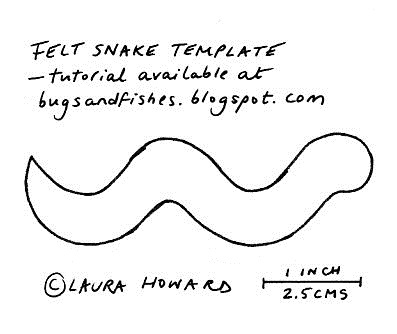 Place the front and back of the snake together and begin joining the edges with whip stitch in matching thread. Start from the snake’s head and sew all along one side towards the tail. 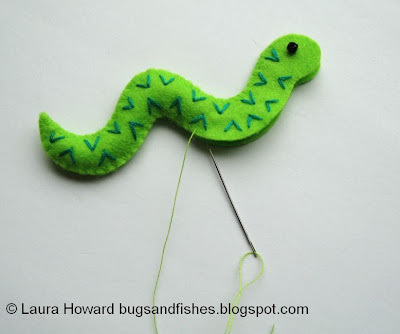 Then sew back along the other side stuffing the snake gradually as you go – sewing a small section, then stuffing it, then sewing a bit more. Stuff the final section and whip stitch the remaining gap closed, then finish your stitching neatly at the back. Variations: sew stripes on your snake instead of the V-shaped stitching, or enlarge the pattern slightly and add sequins. 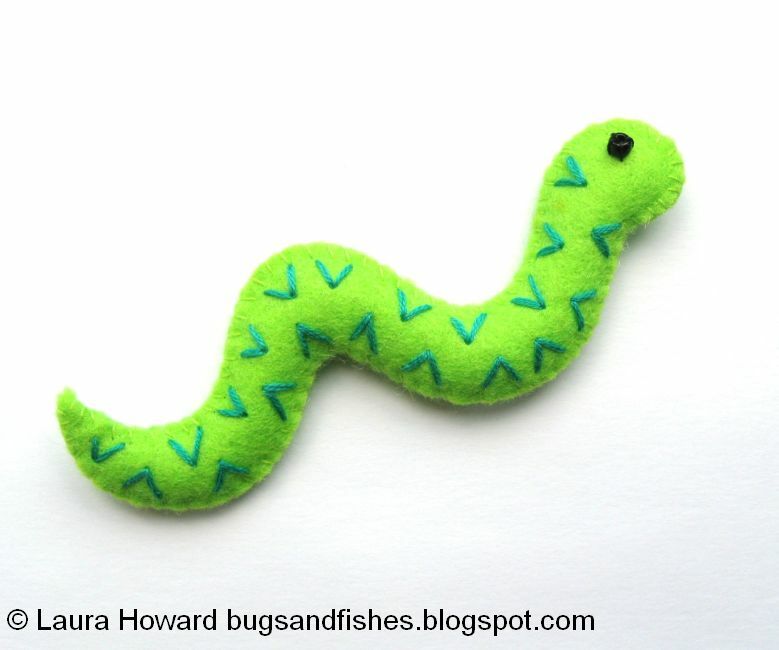 If you enlarge the snake you could also give him a forked tongue cut from felt or made by trimming a piece of ribbon to the right shape. This tutorial is for non commercial use only: you can use it to make as many felt snakes as you want for yourself or as gifts, but please don't make any for sale. You may borrow a few photos if you want to blog about this project, but remember to credit me and link back to the original source, and do not reproduce my entire tutorial on your site. Thanks! 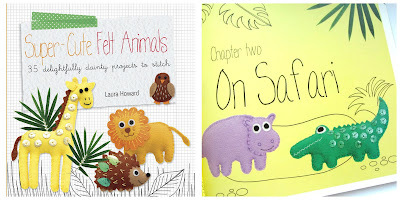 Super Cute-Felt Animals is published by CICO Books, RRP £12.99. 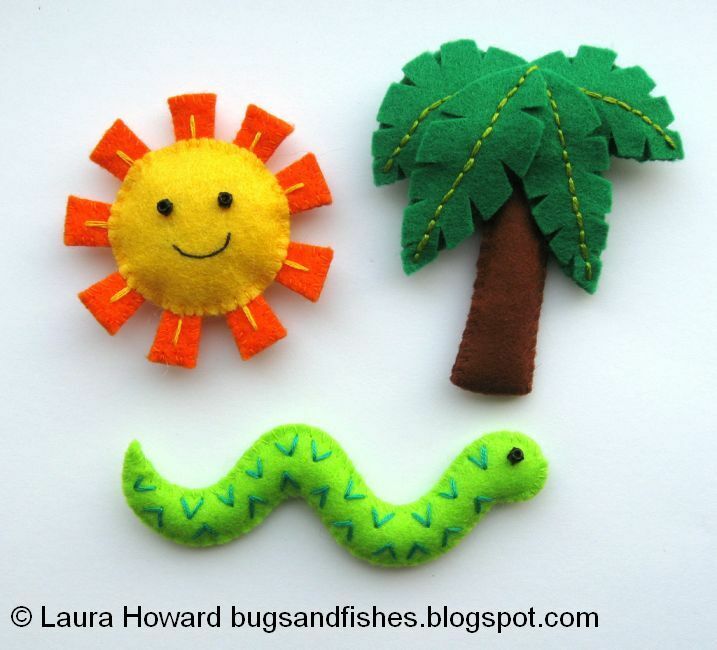 It includes 35 fun felt projects, each with illustrated step-by-step instructions. It's available to buy at Amazon UK and Amazon USA and many other bookshops. Please note: the Amazon links in this post are affiliate links.